Now From $ 1,638 AUDSale! Cambodia’s Angkor Wat is one of the most prominent attractions in all of South East Asia. Long considered ‘lost’, the ruins of Angkor were never really lost to the Khmers, who have used the monuments as religious sites throughout their history. The site includes the ancient city area of Angkor Thom, with its many carved-stone faces standing as silent witnesses to former days of glory, and Ta Prohm, a temple complex slowly being reclaimed by the jungle. We start the trip in vibrant Phnom Penh, capital of Cambodia, and visit the Killing Fields of Choeung Ek, a somber reminder of the reign of Pol Pot. The revitalised city is also home to Wat Phnom, as well as the Silver Pagoda, located in the Royal Palace. Its waterfront, located near the confluence of the Tonle Sap and the mighty Mekong River, is a picture of tranquility and a great place to relax. Our itineraries are updated regularly throughout the year based on customer feedback and to reflect the current situation in each destination. The information included in this Essential Trip Information may therefore differ from when you first booked your trip. It is important that you print and review a final copy prior to travel so that you have the latest updates. Due to weather, local conditions, transport schedules, public holidays or other factors, further changes may be necessary to your itinerary once in country. The order and timing of included activities in each location may also vary seasonally to ensure our travellers have the best experience. Your tour leader will keep you up to date with any changes once on tour. Sua s'dei. Welcome to Phnom Penh, Cambodia. You'll be transferred to your hotel – check with hotel reception for more information about your important group meeting this evening. If you have free time in the afternoon, perhaps stroll the streets of Phnom Penh and explore the city, taking in the interesting French colonial architecture. The National Museum, with its collection of classic Khmer craftsmanship, is well worth a visit. Dinner tonight will be at the restaurant run by Friends International. You might decide to go for a drink at the Foreign Correspondents' Club afterwards. Notes: The restaurant run by Friends International is closed on public and school holidays. Alternative dinner arrangements will be made during these times. Today a full city tour introduces you to the sights of Phnom Penh, a city that lies near the confluence of the Mekong and Tonle Sap rivers. The private quarters of the Royal Palace are home to King Sihamoni and are closed to the public. You will, however, be able to visit the Silver Pagoda that lies in the palace complex, which is the most sacred temple in the country. Phnom Penh remains a living relic of the country’s past struggles and successes. Your included visits to the Tuol Sleng Genocide Museum and the Killing Fields of Choeung Ek tell the story of the tragic legacy of the Khmer Rouge. There is an optional visit to Wat Phnom, the temple that gave rise to the foundation of the city in the 15th century. Later you head out of town to a working monastery to learn more about the life of a monk and Theravada Buddhism. Buddhism in Cambodia is a way of life that most people incorporate into their daily life. You will get to meet the monks, enjoy a sacred water blessing for good luck and prosperity, have a red band tied around your wrist to keep you safe in your travels and see the temple’s fascinating Pagoda art. Note: The Tuol Sleng Genocide Museum and Killing Fields of Choeung Ek are major parts of the experience here, but if you don't wish to visit them, please inform your tour leader. Spend a full day visiting the amazing temples of Angkor on a guided exploration. Angkor Wat is the largest and most complete structure, and the only one of Angkor's temples that has its entrance facing west – the others face east. Then there is Angkor Thom, the 'Great Royal City', a temple famous for its series of colossal human faces carved in stone. Of all the temples visited today, Bayon temple is the centrepiece, with over 200 smiling carved faces and more than 50 gothic towers. For lunch you'll visit the Sala Bai Hotel School where underprivileged local youths learn skills that enable them to find gainful employment in the hospitality industry. Here you can enjoy a meal prepared by students at the school. After lunch it’s off to the Ta Prohm temple, which has large trees embedded in the stone foundations of the structure – powerful symbols of nature. Note: The Sala Bai Hotel School is closed on public and school holidays, so on these days an alternative restaurant will be used. – The services of an expert English-speaking local tour leader throughout the tour. Visit to the Angkor complex: Angkor Wat, Angkor Thom, Ta Prohm, Preah Khan, Banteay Srei and a sunset moment near Angkor Wat. Sightseeing tour of Phnom Penh (including entrance fees where relevant): Tuol Sleng Genocide Museum, Choeung Ek (the Killing Fields), Royal Palace and Silver Pagoda, 3 day Angkor pass (including 2 days with a local guide). Lunch at Sala Bai Hotel School prepared by underprivileged local youths learning skills to find employment in the hospitality industry. 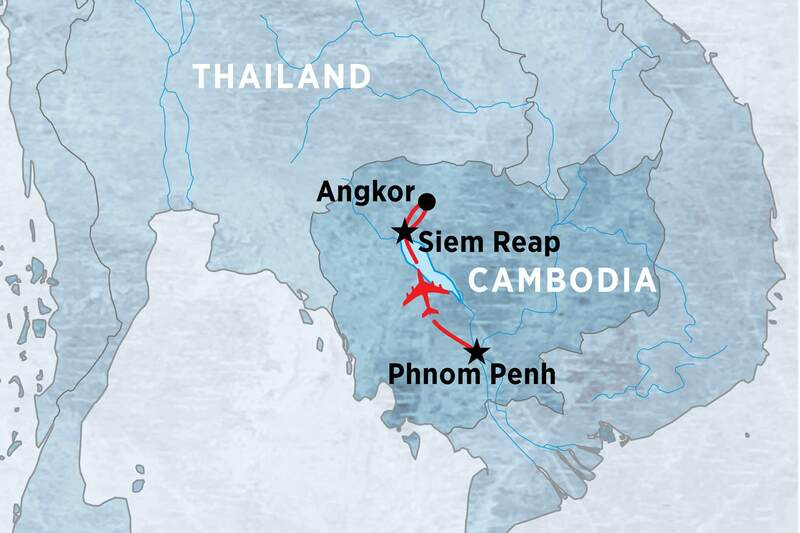 Internal flight between Phnom Penh and Siem Reap.